Heat 10-inch skillet or wok over medium-high heat. Add oil; rotate skillet to coat side. 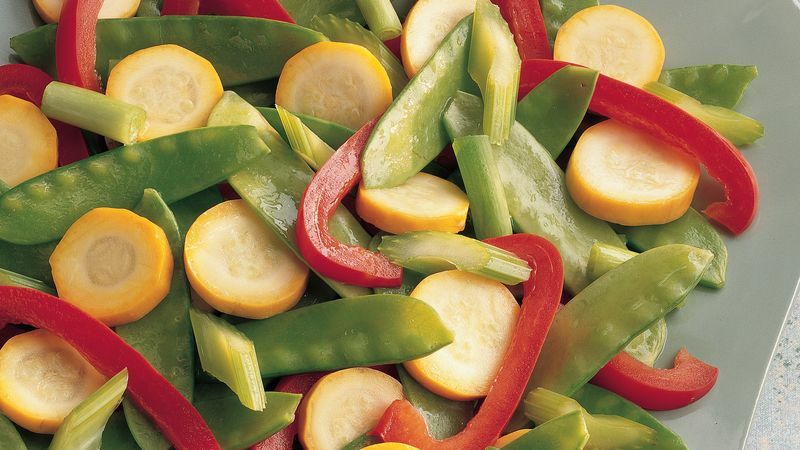 Add squash, bell pepper, celery and onions; stir-fry about 2 minutes or until bell pepper is crisp-tender. Stir in lemon juice, lemon pepper and pea pods; cook and stir about 1 minute or until pea pods are crisp-tender. Bottled lemon juice is readily available and perfect to keep on hand, but for this simple recipe, grab a few fresh lemons from the grocery store. The fresh juice flavors the vegetables wonderfully, and you’ll have enough left to make fresh lemonade. If your zucchini harvest is bountiful, feel free to use one instead of the yellow squash. You’ll need about 1 1/2 cups of 1/4-inch slices.